The final report on the three-year study to develop an Adirondack Community-based Trails and Lodging System plan to enhance recreation-based tourism and help revitalize hamlet centers is now available. The report, conducted by Leading E.D.G.E. 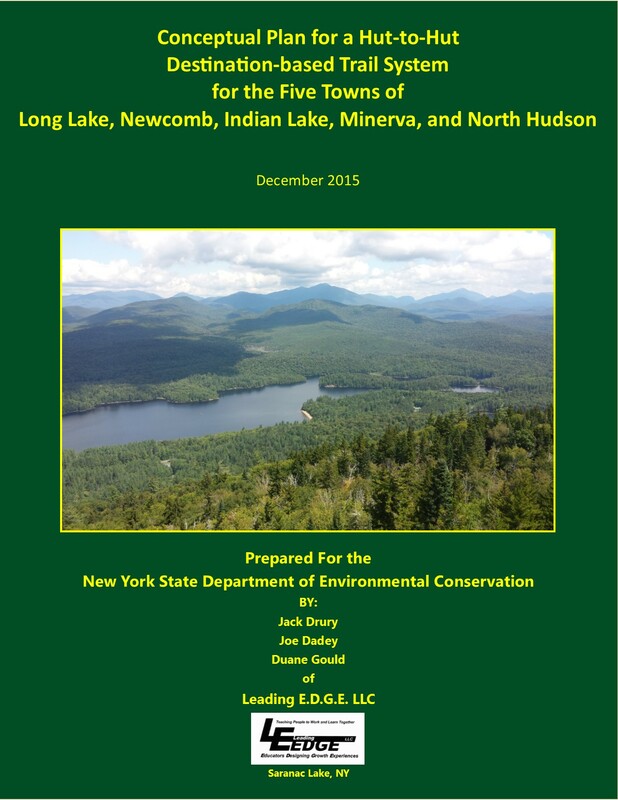 for Hamilton County, was funded by the New York State Department of State under Title 11 of the Environmental Protection Fund and is available HERE. The report, which is over 300 pages in length, contains maps and details on 59 conceptual, community-based hut-to-hut routes throughout the Adirondacks. The report also contains sections on the planning process, international hut systems, North American hut systems, potential economic impact, route system statistics, route difficulty, route prioritization, and an implementation strategy. There also is a section on the demonstration project completed in the Town of Long Lake. The project partners planned and constructed a portion of a spur trail linking the Northville-Placid Trail (NPT) with the hamlet of Long Lake. This section of trail enables hikers to safely access the hamlet of Long Lake without having to walk along Route 28N, allowing hikers to access and enjoy lodging and other amenities within the community. For more information, contact Project Director Jack Drury at jack@actls.org. Adirondack Hamlets to Huts, has received a NYS Department of State, Local Waterfront Revitalization "Adirondack Hamlets to Huts Implementation" Project Grant submitted this past summer for $219,375.00! It will allow us to continue the work initiated three years ago and bring conceptual hut-to-hut routes to life. "Hamilton County will implement the Adirondack Community-based Trails and Lodging System Plan by creating a lodging affiliate system, a hut-to-hut reservation system, and a marketing plan with website, social media, search engine optimization, and paid media. The goal of project is to create, manage and promote a world-class Adirondack hut-to-hut system that advances sustainable communities, conservation, and wellness." Many thanks to Hamilton County for sponsoring this grant and to the NYSDOS. This is a big step in helping AHH transition from planning to implementation. Thanks to all our supporters. Tonight's meeting has been postponed. It has been rescheduled for next Monday December 18 at 7:00 PM. Please note the later start time. Thanks and we hope to see you next Monday. We are keeping a close eye on the weather and will make a final determination regarding Tuesday evening’s meeting in Speculator by Tuesday morning at 10:00 AM. If the Lake Pleasant Central School is on the list of school closings we will definitely postpone the meeting. We may postpone the meeting in either event and will notify you in the morning. Stay tuned and expect an announcement tomorrow morning. The public meeting to share the report findings is scheduled for Tuesday, December 12 at the Lake Pleasant Central School gymnasium at 6:00 PM. The nearly 60 routes will be shared at this time and the public’s input solicited. 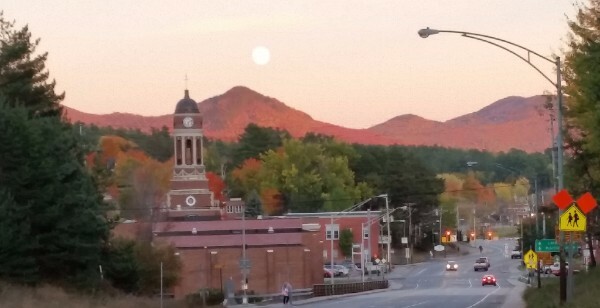 A Project Advisory Committee meeting will be held Friday, December 1 at 10:30 AM in the Adirondack Hamlets to Huts Conference Room at 47 Main Street - 2nd Floor, in Saranac Lake. Topics for discussion include a project update and plans for the project’s public meeting. The public is welcome to attend although space is limited. The Project Advisory Committee is made up of a variety of local government, nonprofit, economic development, recreation, and other stakeholders. The committee oversees the project and provides input on local and regional issues. WCAX reporter Rose Gomez shares this report on Hut-to-Hut efforts in the Five Towns region of the Adirondacks. CARRABASSETT VALLEY, Maine — Maine Huts and Trails continues to expand its network. It is now 80 miles long and includes four off-the-grid eco lodges. People are allowed to move over the trails via people power whether its hiking, skiing, mountain biking or snowshoeing. In this episode, we hike into the Stratton Brook Hut. It's a huffy, three-mile jaunt with a big elevation gain to the hut, which is 1,900 feet above sea level. See the entire store HERE. Joe and Jack shared their personal views on the Boreas Ponds classification yesterday at the hearing in Albany. Here is a link to Joe's statement. My name is Jack Drury. I am from Saranac Lake and have been a wilderness advocate, a resident of the Park, and a licensed Adirondack guide, since 1972. As a long-time Wilderness advocate I certainly appreciate the desire to classify the maximum amount of the Boreas tract possible, as Wilderness. I have given this issue considerable thought, and my nuanced view will probably satisfy none of my friends and colleagues along the continuum of those who desire Wilderness to those who desire motorized uses. In other words I may equally offend everyone. I hope not to. I do not believe that Wilderness classification around the ponds is the only way, nor necessarily the best way, to protect this special place. The issues that will determine long-term protection are; types of uses that are allowed, ease of access, and, most of all, the quality of its management. I’m against motorized access between the current parking lot at 3.5 miles and LaBierre Flow with three exceptions, those exceptions being: administrative use,-- by special permit for the disabled, --and some sort of concession operated by a local guiding/outfitting company on a limited and regulated basis, within the limits of the area’s carrying capacity. I acknowledge that, given enough time, the existing roads would revert back to wilderness. Should we, however, waste this vast potential non-motorized recreational asset? If the state were to try to build recreational ski/bicycle trails similar to those that already exist in the Boreas tract it would cost hundreds of thousands of dollars. Given the desire to boost the local recreation-based economy and the desire to keep from increasing taxes, it seems foolish to let these recreation assets be wasted. Long-term protection and multiple non-motorized uses are not mutually exclusive. Let’s find a way to make it happen. Finally, and most importantly, as passionate as we all are, we must keep this issue in perspective. While communities may, lives do not hang in the balance here. These lands have received some of the strongest protection found in the country and compared with all the problems that need addressing in the Park, much less nationally and internationally, this is a small issue. When it is all said and done, we must find a way to maintain trust and mutual respect amongst all the interest groups across the spectrum, local government, and state agencies. If we fail in this we fail overall. Joe and Jack shared their personal views on the Boreas Ponds classification yesterday at the hearing in Albany. Here is a link to Jack's statement. I really like this Oscar Wilde quote: “Everything in moderation, including moderation.” This quote suggests that there is much value in both moderation and the moderation of moderation, which, when you think about it, ironically supports living in the extremes occasionally. In other words, while a lot of gray may be good, a little black and a little white every now and then is good as well. Applying this maxim to natural resource management decision making, there should be 1) places that are a mix of the protected and the developed; 2) places that are quite developed and 3) other places that are mostly protected. And we have that here in the Adirondacks. We have our Lake Placids and our Siamese Ponds Wildernesses and places in between. As we argue over the degree or lack of moderation that should take place in the Boreas, as we wrestle over our positions about the Boreas lands classification, I encourage us to more consider the interests that underlie our positions so that we can better explore the extent to which our interests more overlap than diverge. We should be wary of using hard line negotiating techniques in the court of public opinion that pollute the discourse over the Boreas because while rhetoric can persuade, it can also poison. We need public participation processes that more promote conversation, not conversion. I suggest that we need to better acknowledge the perspectives and the wants and needs of the other because by doing so, we recognize the other. The value of recognizing the other cannot be overstated. Recognizing does not mean agreeing. Recognizing means respecting. We need to do nuance better and avoid gross generalizations. What we say, and how we say it, matters. At the end of the day, when the dust settles and the Boreas classification decision is made, when the tug of war is over, we need to find ourselves at the same end of the rope, not its opposing ends, so that we can pull together in the same direction, to drag our collective burdens from the domain of problems to the domain of solutions. Our collective burdens consist of many challenges, including the need for places that have ecological integrity and places that provide opportunities for people to experience naturalness and solitude. These challenges also include the need to ensure the livability and viability of the communities inside the Blue Line that contribute so much to the uniqueness and character of the Adirondacks. We need to consider our communities and our protected natural areas more as complements and less as oppositional forces. As this decision process continues to unfold, I encourage us all to conduct ourselves in a manner that considers others’ perspectives, a manner that acknowledges and recognizes and respects the other so that when the decision is said and done, we are able to come together and get about the business of maximizing the probability of a long-standing favorable outcome for the Adirondack Experiment, whereby we realize and demonstrate that humans can in fact protect nature while living in and with nature. I want to remind us all that the ultimate outcome of the ongoing Adirondack experiment may possibly be determined less by our relationship with nature in the Park and, rather, more by our relationships with each other, person to person, group to group. Let’s not lose sight of this. As many of you know, we have long envisioned the need for a new nonprofit to serve as the “thread” that ties all of the complex pieces of a hut-to-hut system in the Adirondacks together, an organization that is the champion of this ambitious initiative and one that incorporates existing lodging to the greatest degree possible while seeking to help fill the gaps where new trails and new places of lodging are needed. I am happy to share with you that Adirondack Hamlets to Huts is the name we have chosen for the new nonprofit moving forward! We are grateful to the Adirondacker focus group who spent an evening in March with us brainstorming possible names for the nonprofit. We are also grateful to those of you who took the time to complete our “name the nonprofit” survey. We received great feedback and lots of participation! It was a challenge to settle upon a name as there were several worthy options on the table. The name “Adirondack Hamlets to Huts” recognizes that the creation of a hut-to-hut system in the Adirondacks will be community-based, that is, the hut-to-hut routes that we will help establish will start, pass through, and finish in communities throughout the Adirondacks. This is consistent with our mission to help maximize the sustainable tourism economies of the towns and villages across the Adirondacks. The term “hamlets” acknowledges that many of the communities in the Adirondacks are small municipalities that have long been called and continue to be recognized as “hamlets.” The term “huts” is an internationally-known term that refers to places of lodging for hikers and skiers that range from modest dwellings that sleep eight people to elaborate lodges that accommodate 300 people and serve fine food, wine and beer. The “huts” that we envision being part of this Adirondack hut-to-hut system will likewise range from the “rustic to the regal” and include high quality cabin tents, yurts, state-of-the art eco-lodges, bed and breakfasts, motels, hotels, and inns. We have also selected a logo for Adirondack Hamlets to Huts courtesy of the fine folks at adworkshop in Lake Placid and those of you who so generously provided the financial means to underwrite the logo design process. Thank you! 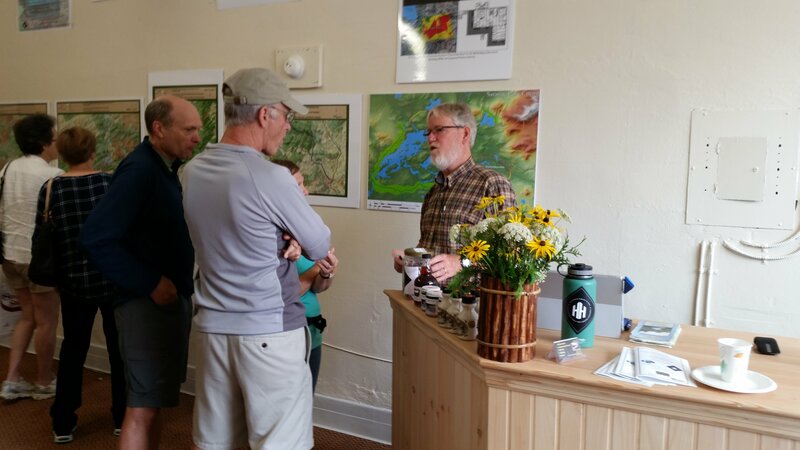 We believe that the double “Hs” will in due time become recognizable and iconic in their own right and become associated with quality experiences on the trail and in all places of lodging provided. 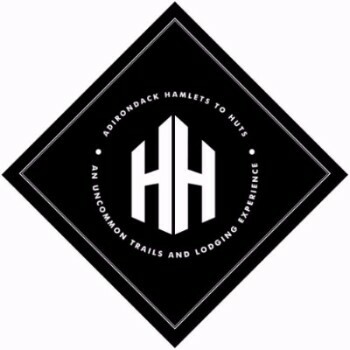 The diamond-shape of the logo intentionally resembles a trail marker as it is our expectation that Adirondack Hamlets to Huts will show hut-to-hut travelers “the way” to good and responsible times and adventures in the woods and on the waters and mountains of the special place that is the Adirondacks. 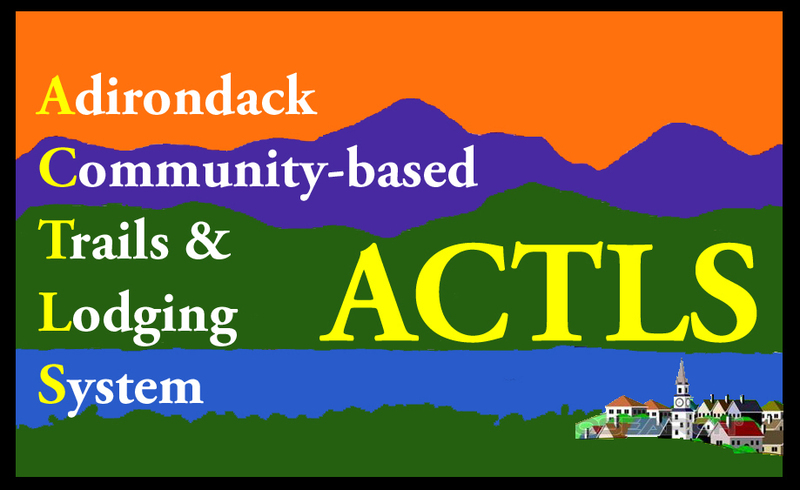 To be clear, Adirondack Community-based Trails and Lodging System (ACTLS) is the name of the project for which we received grant funding from the New York State Department of State (NYSDOS). This project charges us to, in part, conceptualize hut-to-hut routes throughout the Adirondacks. It is the project for which we just facilitated nine community workshops. We will complete the deliverables for the ACTLS project to the NYSDOS by the latter part of 2017. Moving forward, Adirondack Hamlets to Huts will serve as the umbrella organization that coordinates initiatives like the NYSDOS ACTLS project. We appreciate your patience during this transition period. It is an exciting time for us and there is lots of great work to do as we move from “ideas,” “concepts” and “imaginings” to routes with trails and lodging and the provision of experiences for people to make new memories and write new stories. We thank you for your words of encouragement throughout this past year, for the insights you have shared with us in regards to places where routes should visit, where trails could be and what places of lodging are interested in becoming part of the hut-to-hut system, for volunteering your time to help us facilitate our workshops, for your donations in dollars that helped us get the Adirondack Loon and Trails Center up and running, and for purchasing items from our modest resale inventory that helps us pay the rent and keep the electricity on. We need and look forward to your continued support in the year ahead. Happy Holidays and Best Wishes for an awesome New Year! Adirondack Hamlets to Huts is in itself a community-in-the-making. There are lots of good times and adventures with friends and family ahead. We look forward to sharing them with you! We completed a project for the New York State Department of Environmental Conservation entitled “Conceptual Plan for a Hut-to-Hut Destination-based Trail System for the Five Towns of Long Lake, Newcomb, Indian Lake, Minerva, and North Hudson” that describes over 25 conceptual hut-to-hut routes in those towns.Thanks to Marc Gerstman, Rob Davies, Karyn Richards and Bob Stegemann of the NYSDEC, Walt Linck of the APA, and Bill Farber, the Chair of the Hamilton County Board of Supervisors. Thanks as well to Town Supervisors Clark Seaman of Long Lake, Brian Wells of Indian Lake, George Canon and Wester Miga of Newcomb, Steve McNally of Minerva and Ron Moore of North Hudson. The report can be found HERE. 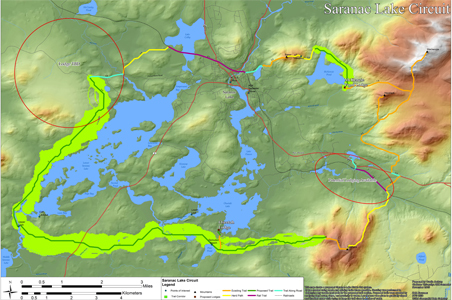 We partnered with classes at Clarkson University last fall to conceptualize a“Saranac Lake Circuit,” a paddle/hike/ski loop that starts and finishes in the village of Saranac Lake and circumnavigates Lower Saranac Lake, Oseetah Pond and Lake Flower. The students also designed prototype state-of-the-art eco-lodges. Thanks to the students and their professors Mike Dinan, Shane Rogers and Bill Olsen! We held a focus group meeting and conducted a survey to help us identify and select a name for the new nonprofit - Adirondack Hamlets to Huts! Thank you focus group participants! We worked with adworkshop of Lake Placid to help us settle on the name of the nonprofit, develop a position statement (“An Uncommon Trails and Lodging Experience”) and design and select a logo. Thanks adworkshop! Thanks donors! 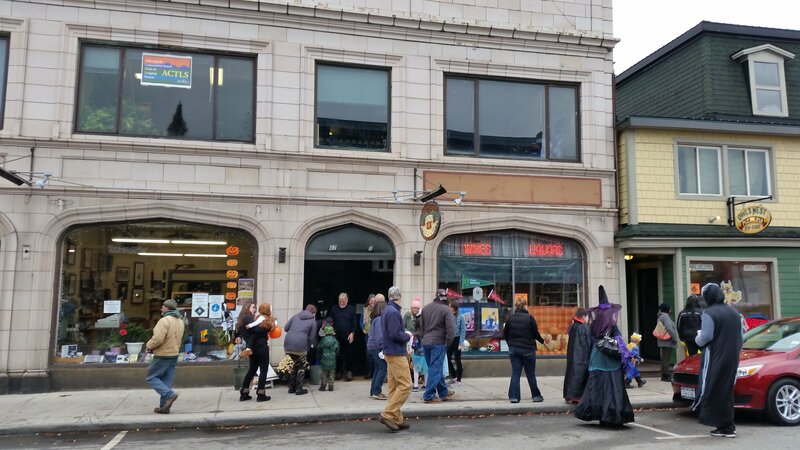 We wrote and received a $28,000.00 Main Street grant for Tousley Property LLC in the spring (they own the historic Tousley Building that we call home!) from the Saranac Lake Local Development Corporation to replace doors and windows with new ones that maintain the historic character but are more energy efficient. Thank you Bill Madden! Thanks too to Paul Van Cott and Jeremy Evans! Working with the Biodiversity Research Institute’s Adirondack Center for Loon Conservation, we helped submit a New York State Environmental Protection Smart Growth Implementation Grant. We were successful and received the $50,000 award! This money will help us and the Adirondack Center for Loon Conservation make necessary improvements to our joint Adirondack Loon and Trails Center. Many thanks to Nina Schoch, Audrey Hyson, Martha Van der Voort, Giulia Bellardini and the rest of the loon crew! We collaborated with the Adirondack Center for Loon Conservation on a joint crowdrise online fundraising campaign. This campaign helped us get the Adirondack Loon and Trails Center up and running. Thanks to you! We have partnered this fall with Professor Kelly Cerialo and her Field Studies in Hospitality class to survey Adirondack lodging operators on their facilities and services. We will co-host with the PSC team a focus group meeting of lodging operators December 1st to share the results of the survey and elicit from them feedback on what a hut-to-hut management system of lodging operations could look like. Thanks to Kelly Cerialo and her students! We are on the verge of becoming incorporated and on our way toward filing for 501(c)(3) nonprofit status. Thanks to our Founding Board Members Jan Hesbon, Janice Fitzgerald, and Spencer Morrissey. More to follow on this effort and these fine folks! Deep thanks as well to Amy Smith, Esq., for her creativity and legal assistance that has helped us advance this effort in a major way. We continue to make progress on the NYSDOS ACTLS grant. We extend much gratitude to Bill Farber of Hamilton County without whom this project would have not gotten off the ground. Many thanks too to Nancy Berkowitz, our NYSDOS ACTLS grant administrator. 1. Make an immediate donation via PayPal by clicking HERE. NOTE: We regrettably are unable to provide a tax deduction at this time for donations made via PayPal because we have yet to receive nonprofit 501(c)(3) status. A donation made this way will provide you with a tax deduction for your gift courtesy of our fiscal sponsor, the Saranac Lake Rotary Foundation, Inc.
3. Purchase some maps, books, AHH clothing and/or other fun merchandise that allows us to keep the landlord happy! PSSST: If you come into the Adirondack Loon and Trails Center and mention that you saw this offer in the newsletter, you will receive a 10% discount on your purchase. Thanks again for your support and well wishes to all! will be keeping you abreast of our activities and news about the outdoors on a regular basis. Project Management by Leading E.D.G.E.